WASHINGTON -- Justice Department Special Counsel Robert Mueller has launched a grand jury in his investigation of Russian influence in the 2016 election, The Wall Street Journal reported Thursday. 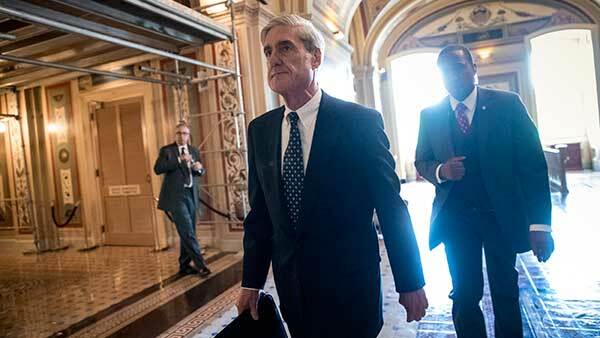 Citing unnamed people familiar with the matter, the Journal said Mueller had impaneled the grand jury in Washington, where his team of investigators continue to look into whether President Donald Trump or any of his campaign associates colluded with Russia during the presidential contest. Meanwhile, Reuters reported that subpoenas had been issued in connection to Donald Trump Jr.'s 2016 meeting with a Russian lawyer. The news agency cited two sources familiar with the matter. That meeting has drawn scrutiny since an email exchange beforehand indicated the Russians offered damaging information on Hillary Clinton. The move would signal a new step in the investigation, which Trump has lambasted as a "witch hunt." Trump has denied any collusion between his team and the Russians. US intelligence agencies have concluded that Russia attempted to sway the presidential contest in Trump's favor. Ty Cobb, special counsel to the President, said he wasn't aware that Mueller had started using a new grand jury. "Grand jury matters are typically secret," Mr. Cobb said. "The White House favors anything that accelerates the conclusion of his work fairly... The White House is committed to fully cooperating with Mr. Mueller." A spokesman for Mueller's office declined to comment on the report. Federal investigators have seized on Trump and his associates' financial ties to Russia as among the most fertile avenues for moving their probe forward, people familiar with the investigation tell CNN. Those subpoenas were issued by the US Attorney's office in Alexandria, Virginia, but the Wall Street Journal report indicated that Mueller would utilize a grand jury based in downtown Washington, near the offices where Mueller and his team work. The question of Russian interference has hung over Trump's presidency for months, even as the White House has sought to wall itself off from the matter. Trump has retained a team of lawyers to handle the growing legal swirl.